How to stretch a shade sail? A well-tended shade sail is a sail that will last a long time. By respecting the rules of installation and by using adjustable pulleys, you make sure that your canvas always remains stretched under the best conditions. Why is it important to stretch a shade sail? A shade sail is exposed to multiple climatic conditions: mainly wind and rain. If its fabric is designed to best withstand these, its installation conditions also affect its life. Risk of not allowing enough rainwater to escape: pockets of water will be created which will pull on the canvas and damage it. How to install a shade sail to stretch it well? 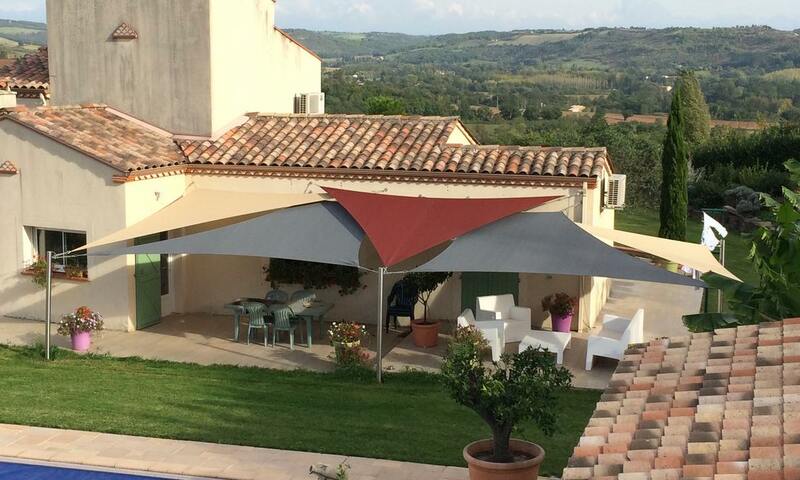 The positioning of the attachment points of the shade sail is crucial for its installation. It is often a question of torsion: the canvas must be stretched, but also inclined on a slope of 20 to 30% to facilitate the flow of the rainwater. It will be necessary to provide a difference in altitude between the highest point and the lowest point of your sail. The latter will preferably be in an angle, to naturally guide the liquid. To maintain the tension of the canvas, the fasteners must be installed in extension of one of the diagonals of the sail. It is necessary to foresee sails not too big, beyond a certain surface, the force exerted by the wind would be too powerful. In very windy regions, it is also advisable to prefer several small superimposed sails rather than a larger ones and to favor triangular sails. When you install your shade sail, you will leave the pulleys relaxed until the sail is fully secured. Only then can you start tightening them one by one until the canvas is taut enough. What is the right tension of a shade sail? A shade sail is provided to withstand a pressure of 30 to 50 kg on each anchor point. You should not be afraid of pulling on the pulleys too much, which will help you maintain this pressure. If they are tight, they should maintain the tension of the sail for several weeks, but do not hesitate to tighten it regularly, especially after strong winds. You will notice that a sail that is not tight enough will vibrate in the wind, like the string of a musical instrument. If it happens, or it folds, it's time to retender it. Do not be afraid to pull a little on the sail: its fabric is expected to stretch a few centimeters under pressure. We also provide sails whose fabric has a slight curvature , to facilitate tension. This is also why it is recommended to leave an interval of thirty to fifty centimeters between the canvas and the point of attachment (or more if the sail is large). Our tension systems , including a rotational nautical rope, a pulley and a carabiner, will facilitate the installation of your sails shading, and reassure you about the tension exerted. Thanks to the cleat, the rope like the canvas, will remain well tensioned for a long time. Also read: How to maintain a shade sail?